No doubt plotting to resuscitate its flagging portable powerhouse, Sony today revealed God of War: Ghost of Sparta is in the offing, another prequel in the company's myth-themed meat-tenderizing series exclusive to the PSP. The last one, God of War: Chains of Olympus, sold some 2.5 million copies. A sequel (or post-prequel prequel) was probably inevitable. 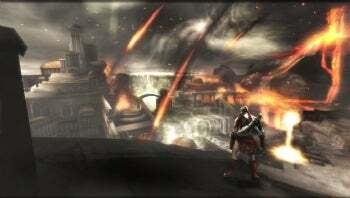 Where Chains of Olympus sets up just before the original God of War for the PlayStation 2, Ghost of Sparta slots in right after, "telling the story of Kratos' ascension to power as the God of War." The presser alludes to Kratos' nightmares, lost worlds, and answering "long-awaited questions about his dark past" (really, did we need to wait for the prequel to get these?). Kratos' trademark chain-slung Blades of Chaos are back, as are ye olde panoply of "mythological monsters," "legions of undead soldiers," and--wait for it--"amazingly dangerous and brutal landscapes." Amazingly! You might find the tech specs more interesting. Sony promises the game will have "higher quality environments" and "give players a realistic feel that has never been seen before on the PSP or any other portable platform." 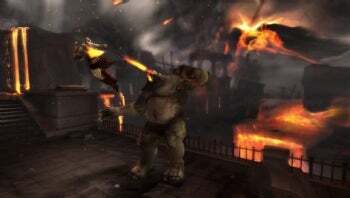 SCEA PR manager Eric Levine adds "I can also tell you from first-hand experience that we are pushing the limits of what PSP can do with state-of-the-art visual technologies, higher resolution environments, and greater depths of scale." Big words, and here's some big math to go with it: "25% more gameplay," which if memory serves means a couple extra hours of monster mangling (you can dash through Chains of Olympus in about five). All I care about is that Ready at Dawn (the Chains of Olympus guys) are handling it. Chains of Olympus didn't knock my socks off, but it translated the God of War experience as well as anyone could to a single-analog-thumb-nub, tiny-screen interface. Look for Ghost of Sparta later this year, and hands-on impressions at E3 2010 in June.